other. Bandages should be applied evenly, firmly, but not too tightly. Excessive pressure may cause interference with the circulation and may lead to disastrous consequences. In bandaging an extremity, it is advisable to leave the fingers or toes exposed so the circulation of these parts may be readily observed. It is likewise safer to apply a large number of turns of a bandage, rather than to depend upon a few turns applied too firmly to secure a compress. In applying a wet bandage, or one that may become wet, you must allow for shrinkage. The turns of a bandage should completely cover the skin, as any uncovered areas of skin may become pinched between the turns, with resulting discomfort. In bandaging any extremity, it is advisable to include the whole member (arm or leg, excepting the fingers or toes) so that uniform pressure may be maintained throughout. It is also desirable in bandaging a limb that the part is placed in the position it will occupy when the dressing is finally completed, as variations in the flexion and extension of the part will cause changes in the pressure of certain parts of the bandage. The initial turns of a bandage on an extremity (including spica bandages of the hip and shoulder) should be applied securely, and, when possible, around the part of the limb that has the smallest circumference. Thus, in bandaging the arm or hand, the initial turns are usually applied around the wrist, and in bandaging the leg or foot, the initial turns are applied immediately above the ankle. The final turns of a completed bandage are usually secured in the same manner as the initial turns, by employing two or more overlying circular turns. As both edges of the final circular turns are exposed, they should be folded under to present a neat, cufflike appearance. The terminal end of the completed bandage is turned under and secured to the final turns by either a safety pin or adhesive tape. When these are not available, the end of the bandage may be split lengthwise for several inches, and the two resulting tails may be secured around the part by tying. ROLLER BANDAGE FOR ELBOW.A spica or figure-eight type of bandage is used around the elbow joint to retain a compress in the elbow region and to allow a certain amount of movement. Flex the elbow slightly (if you can do so without causing further pain or injury), or anchor a 2- or 3-inch bandage above the elbow and encircle the forearm below the elbow with a circular turn. Continue the bandage upward across the hollow of the elbow to the starting point. Make another circular turn around the upper arm, carry it downward, repeating the figure-eight procedure, and gradually ascend the arm. Overlap each previous turn about two-thirds of the width of the bandage. Secure the bandage with two circular turns above the elbow, and tie. To secure a dressing on the tip of the elbow, reverse the procedure and cross the bandage in the back (fig. 34). 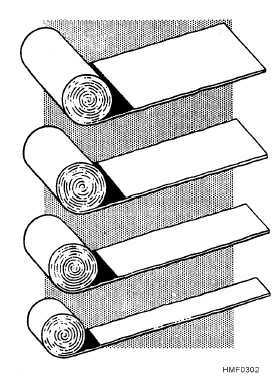 3-4 Figure 32.Roller bandages. Figure 33.Applying a roller bandage.